Insalata caprese is of my favorite salads. 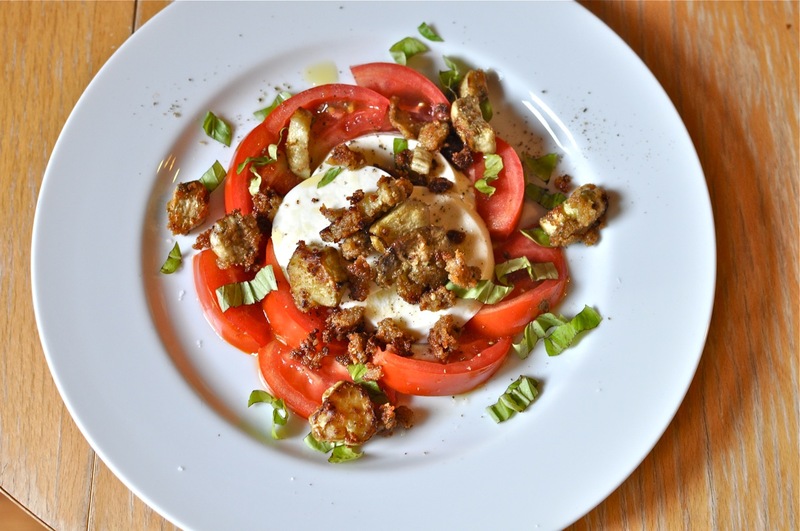 Not much can top ripe sweet tomatoes, creamy slices of fresh mozzarella, and anise flavored slivers of basil. Well, that's not entirely true. One thing can top it - eggplant croutons. Yep, you read that right. I know croutons are traditionally toasted bits of bread, but there is no reason you can dice up some eggplant while it is in season and fry it to a crisp for your salad topping. This is ideal when you are using the mini eggplants that you see at your local farmers' markets or in your CSA bag. You can follow my recipe for the perfect pan-fried eggplant by clicking here. Just use the smaller eggplants (or even the Japanese varieties) and cut it into smaller pieces. Also, my instant insalada caprese recipe is here. Simply combine these two ideas for a wonderful lunch. Or if you are like me this can be a great main dish while your carnivore indulges in his latest grilled creation. Don't be surprised though if he pops a few of these crunchy crumbs in his mouth though. They are hard to resist. Even my baby omnivore thinks this fried finger food is tops. Hope you agree! I like the idea of the fried eggplant with marinara sauce -- gonna have to try that! I love eggplant any way I can get it, especially in ratatouille! Great idea. I've been trying to cut back on the bread lately. Which means more salads without croutons. Which means fried eggplant sounds great on the lunch salad. Thanks for the post. We have gotten so much eggplant in our CSA this year it's good to have lots of ways to enjoy it! Eggplant crutons are a great idea! Thanks! What a brilliant recipe, really got to try this one!